ILEAS just completed its 14th Annual Conference at the Crowne Plaza in Springfield. Conference evaluations are still being reviewed but the initial response has been very positive. 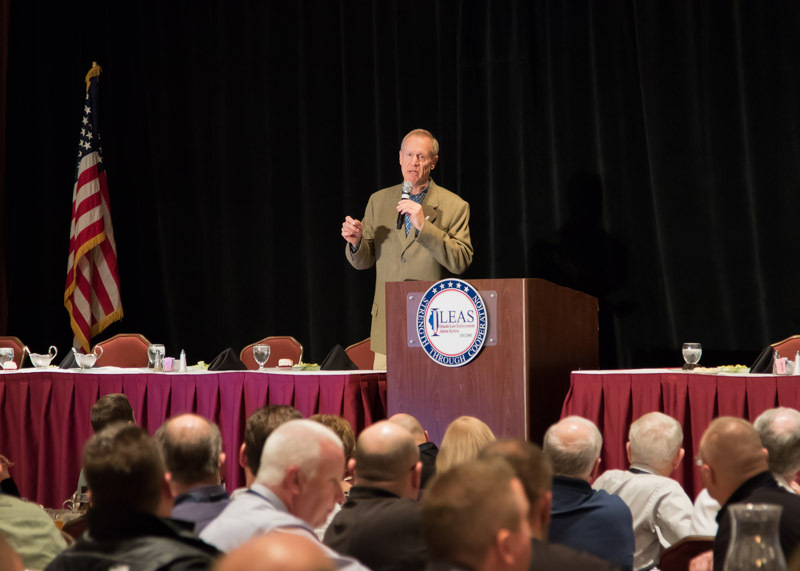 This year was special because Governor Bruce Rauner spoke at the banquet Monday evening to a packed house. He took time out of his busy day to stop by to encourage our members to keep the faith. He also expressed his "complete support" for law enforcement in Illinois and for ILEAS in particular. He promised to do everything in his power to ensure that ILEAS has sufficient funding to do its job. Prior to addressing the banquet, he spoke with with Director Page, the ILEAS Executive Officers and ILEAS Foundation President Mark Beckwith where he also expressed his support. Afterwards, he spoke for a bit to a packed room at the banquet to the Conference attendees. He gave a great speech recognizing law enforcement in general and ILEAS specifically. He received mutliple standing ovations and applause. Both before and afterwards he walked by many tables shaking hands and taking photos with many gathered there. Thank you, Governor Bruce Rauner!